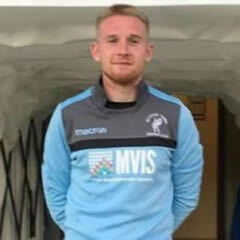 Ross joined Matlock from Alfreton Town in September 2018 after a spell on loan at Shefield FC. Nottingham born he was with the Nottingham Forest Academy before having a loan spell at Ilkeston FC during 2016 and then moving to Boston United in December 2016. A move to North Ferriby United followed in July 2017 and was a star performer in what proved to be a testing season which saw the Villagers relegated from National League North. He moved to Alfreton during the summer of 2018.